Years ago I fancied myself an elaborate cook. My husband and I still talk about the days — before kids — when I put a ton of time into cooking dinner each night. It was my “fun” back then, so it made sense. I enjoyed passing the time cooking. While I still DO enjoy cooking, I realize the days of having someone beg me to play chess with them (see my Let’s Do This, This Summer List) or someone needing me to take them to golf practice will come to an end in a blink. So for now, I’ve put elaborate cookery on the back burner. (See what I did there?) It’s one of the reasons I rely so heavily on freezer meals. All that said, it’s probably not that surprising that we don’t entertain a lot around my house these days. I dunno if it’s my unmillennial status or just the reality of this life stage, but it’s rare that we have guests over. 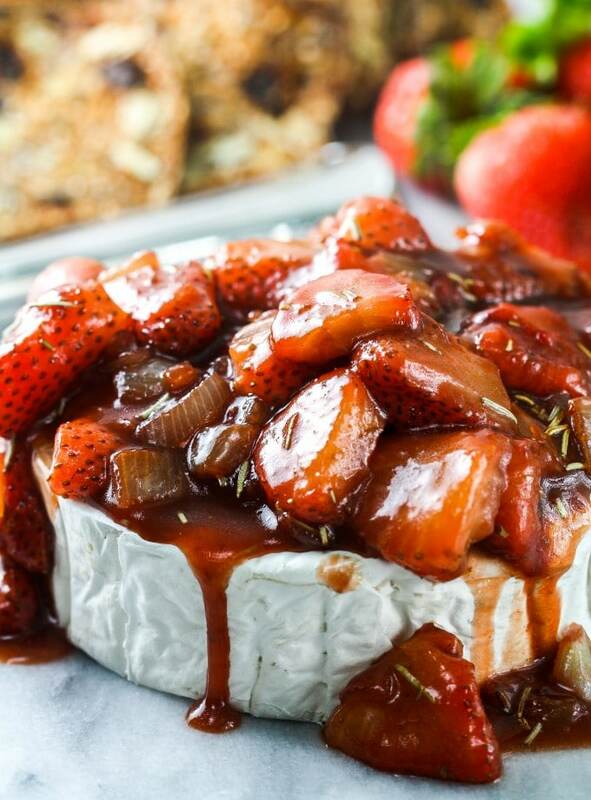 When we do, though, I rely on EASY recipes… like this easy brie appetizer recipe I’m sharing with you today. Now that the weather has broken free (mostly) from spring rains and the tiny bit of chill we get down south, I do find myself wanting to have a friend or two over… to sip a little wine, share a few war stories of our recent motherhood struggles (listen to The Cell Phone Monitoring Episode to catch a glimpse into what I’m struggling with most right now) and nosh on something like this that’s seasonal, savory and very satisfying. What about you? If you’re in the same unmillennial life stage as me, do you entertain more or less these days? Heat oil in a skillet over medium-high heat. Add onion and saute 5 minutes or until tender. Sprinkle with rosemary and salt; cook an additional 2 minutes. Add strawberries and saute 2 more minutes. Add in vinegar, orange juice, and preserves, stirring well and cooking until thickened (about 10 minutes). 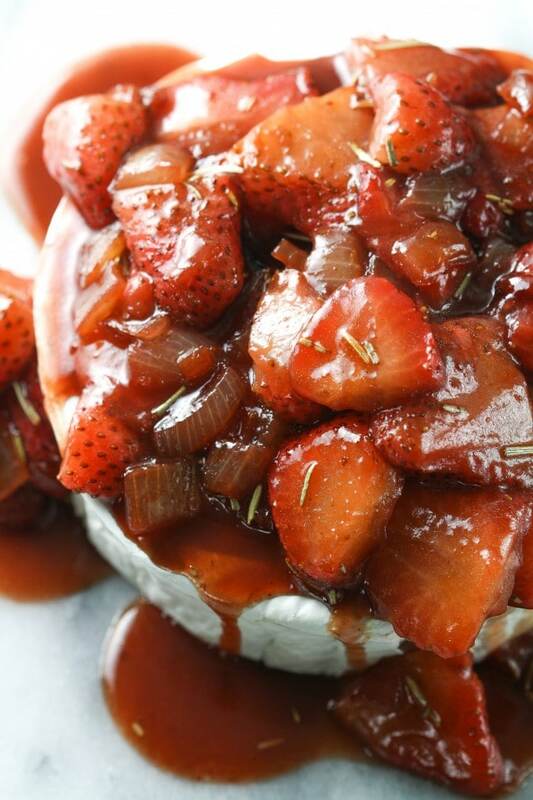 Place brie on a small plate; remove strawberry mixture from stove and pour over brie. 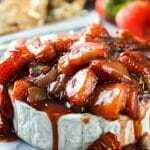 Serve with crackers or crostini.